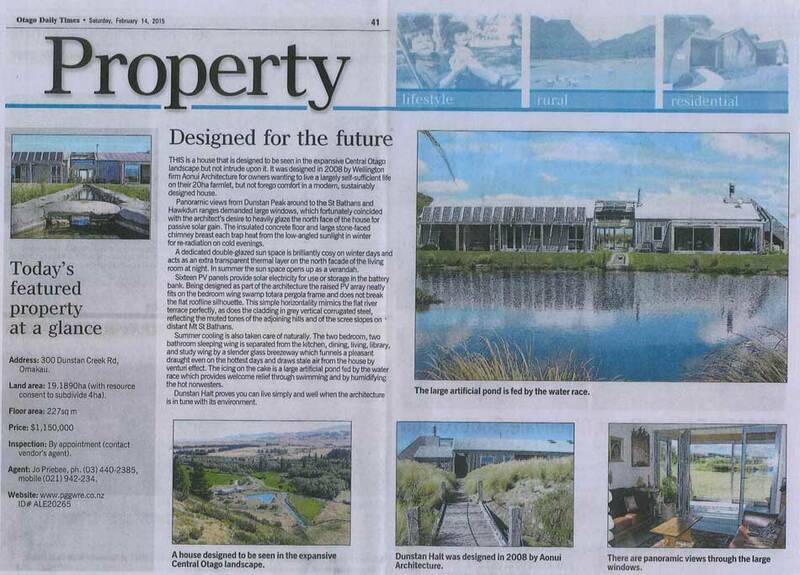 Otago Daily Times ran this promotion on 14 February 2015 for our much loved Dunstan Halt which is on the market! This is a house designed to be seen in the expansive Central landscape but not intrude upon it. It was designed in 2008 by Wellington firm Aonui Architecture for owners wanting to live a largely self sufficient life on their 20 ha farmlet but not forego comfort in a modern sustainably designed house. Panoramic views from Dunstan Peak around to St Bathans and Hawkdun ranges demanded large windows which fortunately coincided with the architect’s desire to heavily glaze the north face of the house for passive solar gain. The insulated concrete floor and large stone faced chimney breast each trap the heat from the low angle sun in winter for reradiation on cold evenings. A dedicated double glazed sun space is brilliantly cosy on winter days and acts as an transparent extra thermal layer on the north facade of the living room at night. In summer sun space opens up as a verandah. Sixteen PV panels provide solar electricity for use or storage in the battery bank . Being designed as part of the architecture the raised PV array neatly fits the bedroom wing swamp totara pergola frame and does not break the flat roofline silhouette. This simple horizontality mimics the flat river terrace perfectly as does the cladding in grey vertical corrugated steel reflecting the muted tones of the adjoining hills and of the scree slopes on distant Mt Bathans. Summer cooling is also taken care of naturally. The two bedroom, two bathroom sleeping wing is separated from the kitchen, dining , living, library and study wing by a slender glass breezeway which funnels a pleasant draught even on the hottest days and draws stale air from the house by venturi effect. The icing on the cake is the large artificial pond fed from the water race which provides welcome relief swimming and humidifying hot norwest ers. Dunstan Halt proves you can live simply and well when the architecture is in tune with its environment.